Opening up a new independent practice can leave you filled with mixed emotions. On one hand, you're completely thrilled to have your very own practice where things will be done your way, but on the other hand, you have the stress of the logistics weighing down on you. Investing in a great eyecare practice management system can help take care of some of the stress of getting your new practice up on its feet. Today, we want to explore some of the benefits practice management systems have to offer new practices. A good practice management system will include patient profiles that organize everything you would ever need to know about each of your patients. Things like insurance availability, medical history, allergies, and even photos of the patient can be kept securely in one simple place. Patient profiles are a great way for your office to stay organized as you get familiar with your new patients. You're opening your own practice so that you can do things your way, and that should include your practice schedule. A practice management system with a customizable scheduler lets you view your day the way that makes the most sense to you. Flexibility in organization can help you make your practice just as unique as you are. Chances are money might be a little tight as you open a new practice, but investing in a practice management system that includes claims management will pay off and help keep your budget on track. With claims management you can make sure that you are submitting claims correctly so that you get reimbursed faster. Some systems will allow you to track your claims in real-time, so you can always know their status. This is an area where a lot of practices lose money, so start off on the right foot by staying on top of your reimbursements. Proper analysis is key for new practices. By analyzing different areas of your practice, you are able to spot inefficiencies and are then able to direct your attention to improving them. A practice management system with operational, financial, and auditing reports offers insight to all areas of your practice, so nothing goes unnoticed. On top of looking at reports, monitoring benchmarks in your practice is also important. Check out this eBook to learn about 8 benchmarks your practice should be monitoring on a regular basis! One of the most important elements you need to create a successful practice is loyal patients. To create loyal patients, your practice needs to offer relationship-based care. Patient portals are great tools for building relationships with patients because they allow you to communicate securely online. With a patient portal you can answer questions and give treatment instructions to your patients. You can even have your patients use their portals to fill out pre-appointment paperwork and review their exam history, saving both them and you time when they come in for their visit. The right eyecare practice management system can help get your new practice off to a great start. The five benefits we've highlighted just begin to scratch the surface of how helpful a great system is. Once you implement your system into your practice, you'll be able to experience all of the benefits in your office! 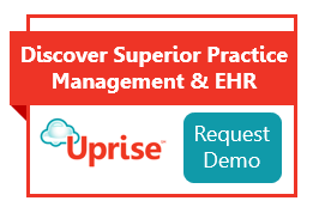 Looking for a great cloud-based practice management and EHR software? Check out Uprise!